My sister-in-law, Susie, had never seen an albatross. I decided that this situation must be rectified, and booked us both onto Neil Macumber's May 2016 Port Fairy pelagic. The trip planned for 8 May was cancelled due to bad weather, and re-scheduled for 29 May. On Saturday, 28 May, Susie and I set off together like excited schoolgirls wagging school. I'd selected the May trip in the hope that Susie might see a great albatross. I explained to Susie that she must take Travacalm, that the seas would be rough, it would be freezing cold, and we would get wet: if it did not rain, we could expect to be engulfed in seaspray. Everything I said was wrong. The seas were calm; the temperature was mild; the weather was fine; we came home quite dry. We did not need Travacalm. The boat left port right on time at 7 a.m. It was still dark. Nothing much happened for a while, but I thought it didn't matter. Susie would certainly see some sort of albatross during the day, so she'd come away happy. 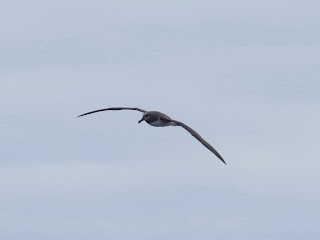 Sure enough, not all that far out of port, a Shy Albatross flew past the boat, giving us all good views. Susie cheered. I relaxed. Mission accomplished. Then a Northern Giant-Petrel flew past, very close, letting us all admire it without using our binoculars. Susie made all the appropriate noises. By the time we got to the shelf at 10.30, my bird list was not long (Fairy Prion, Crested Tern, Wilson's Storm-Petrel, Australasian Gannet, Yellow-nosed Albatross, Little Penguin, Great-winged Petrel) but I was happy. Susie had now seen two species of albatross, and it didn't matter if nothing else appeared. Susie, who is an artist, was admiring the cloud formations as much as the birds. Slowly, things started to happen. There was a Black-browed Albatross, then a Campbell's. I was delighted when a Wandering Albatross appeared. It flew around slowly, allowing Susie to drink it in. It was the first of six wanderers we saw during the day, including one young clown. 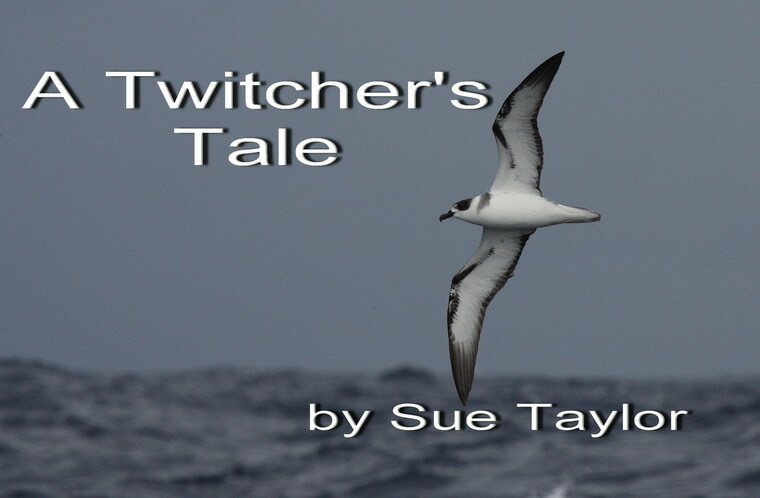 Not only had Susie now seen five species of albatross, she'd seen a great one. What's more, it was a pleasant, calm, mild day. We were blessed. Suddenly, a Grey-headed Albatross appeared! I could not believe my eyes. It had a very dark head, looking more black than grey. 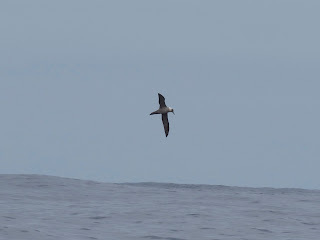 Then a Sooty Albatross flew overhead! 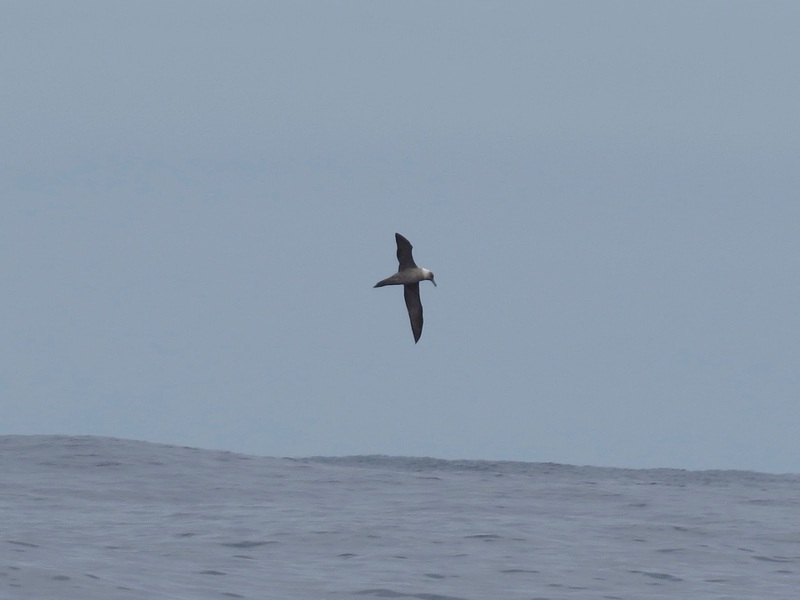 And very soon after that a Light-mantled Sooty Albatross put in an appearance! These were birds I'd never dared to hope for. The albatross were making a special effort for Susie. The whole boat was in celebratory mood. Everyone was happy. We saw a Grey-backed Storm-Petrel and a Cape Petrel. 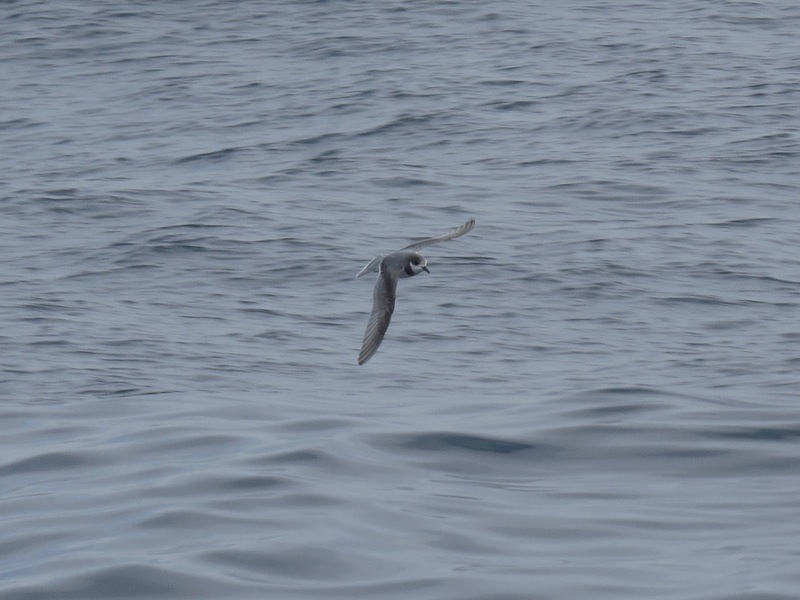 We'd seen quite a few Fairy Prions throughout the day, and suddenly a Blue Petrel appeared! 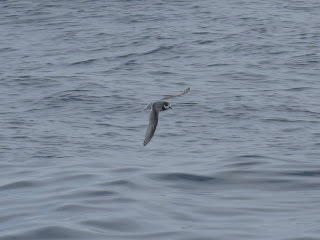 On the way back home, there were large flocks of Fluttering Shearwaters, and suddenly, a tern caused great excitement. General consensus was that it was an Arctic Tern. What a day! Several people on board considered it the best pelagic they'd ever been on. Susie has gone home with quite the wrong idea about pelagic birding. I should take her again just to show her what it's usually like. Buoyed by my success in sighting the Copperback Quailthrush, Rog and I set off westwards, confident in our quest for the recently split Naretha Bluebonnet. 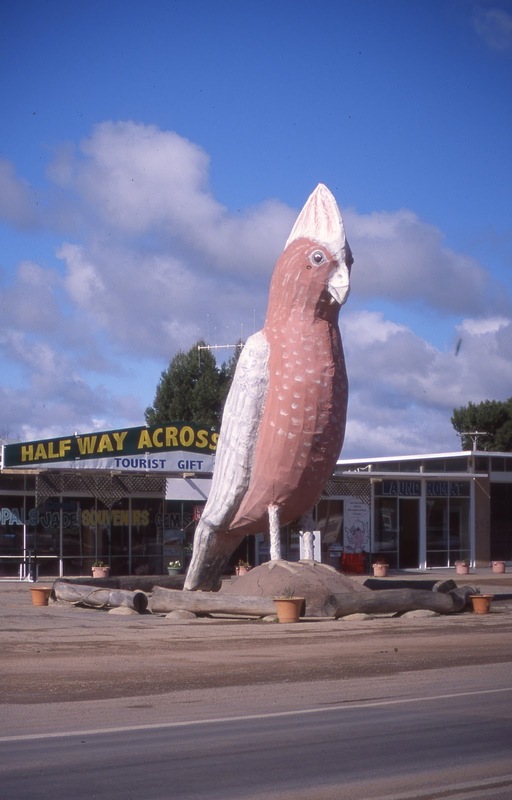 This bird has an interesting distribution, with two discrete populations: one centred on Rawlinna and Naretha along the transcontinental railway and the other further south, from Cocklebiddy to Border Village, straddling the Eyre Highway. It is found in pairs or small parties up to ten birds, and inhabits myall, with bluebush, mulga, belar or sugarwood. Forshaw says: 'It shows a definite preference for certain species of trees and one can often predict its presence merely by the vegetation.' I've spoken to people who've seen Naretha Bluebonnets at Rawlinna and at Border Village. I was aware that the bird was classified as moderately common to common, so why not be confident? 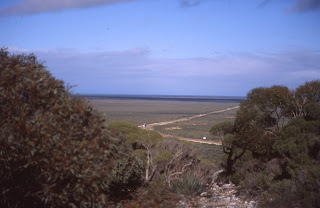 We started looking as soon as we reached Border Village, which is located (appropriately) on the Western Australian/South Australian border. We stopped at every roadside stop. I walked in every easily accessible stand of myall. We spent the night at the Mundrabilla Roadhouse. I am too old to make basic mistakes. Or I should be. I have been birding for too many years to go anywhere without my binoculars. And yet I did. 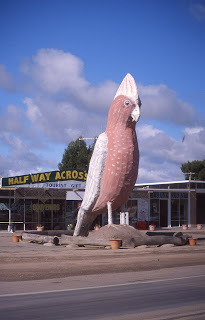 The next morning, while we were having breakfast in the Mundrabilla Roadhouse, I saw a parrot fly past the window! I dropped my knife and fork and rushed outside, pushing past the bewildered tourists milling about in the shop. Of course the parrot was no longer in sight. It had flown to the east. My binoculars were in our room, in the other direction. Now, what should I do? Chase the parrot, and not be able to identify it without binoculars? Or go and collect my binoculars and risk losing the parrot in the meantime? I opted to get my binoculars. I ran (yes, ran) to our room. Hardly dignified I know. But this was a possible Naretha Bluebonnet. A lifer. My uppermost thought was, how delighted Roger would be if I saw the parrot now and he could go home! I grabbed my binoculars and returned to the tree where I'd last seen the bird. It was still there! But, before I could focus on it, it flew again. Alas! I could see immediately that it was not a bluebonnet. It was too big, with an extremely long tail. It was, without doubt, a Princess Parrot! The parrot flew over the buildings, never to be seen again. I returned to Roger and enjoyed cold scrambled eggs more than I ever have before. Or probably will again. Roger was reading a newsletter from Norseman, which announced that the Cocklebiddy/Rawlinna Road was to be sealed. We drove on to Cocklebiddy, where we were told that the road to Rawlinna was impassable. People instead took the road to Haig, which was slightly better and took five hours. I had with me an extract from Finding Australian Birds, A Field Guide to Birding Locations by Tim Dolby and Rohan Clarke. At page 425, it states: 'A good spot to search for [Naretha Bluebonnet] is 10 km north of Cocklebiddy. . . the Blue Bonnet often perch in stands of Sheoke (Allocasuarina) in this area.' I asked the helpful fellow at Cocklebiddy if we could make it up the Rawlinna Road for 10 km. He said that we could. And so we did. We drove up the Rawlinna Road as far as the Arubiddy homestead. (We had phoned Arubiddy before we left, to inform them of our plans.) Alas, I did not see any casuarina at all. There were few trees. All I identified were myalls. There were certainly no 'stands of Sheoke.' (I've always said 'she-oak,' but I defer to Dolby and Clarke.) Disappointed, we returned to the Cocklebiddy motel, and planned a trip up the road to Haig the following day. When we walked to the diningroom in the dark at 6.30 the next morning, it was cold but fine. While we were eating breakfast, the fog rolled in. Our departure was delayed. The roads to Rawlinna and to Haig are not signposted. There is a star picket in a 44 gallon drum at the intersection of the road to Haig. It is off-road, half hidden in tall grass. It is difficult to see in daylight, without fog. In the dark and the fog we had no chance. We waited. I admired many spider webs outlined in dew, very pretty in the fog. The spider webs were beautiful in the morning fog. Finally we left, but I knew in my heart of hearts that this trip to Rawlinna via Haig was doomed from the start. The road was not in good condition, forcing Rog to crawl along frustratingly slowly. The gates were extremely difficult to open. In fact I could not open them: I simply was not strong enough. At the fourth gate, we'd been driving for an hour and had covered 12 km. We weren't going to make it in five hours as predicted by the helpful fellow at Cocklebiddy. It was 130 km to Haig, and from there we'd have to go to Rawlinna. For us the trip was impossible in a day, even if we had not suffered a fog-induced late start. We turned back. As I'd ticked the Copperback Quailthrush thanks to local knowledge, I decided to seek some local knowledge to help with the Naretha Bluebonnet. I phoned the Eyre Bird Observatory to ask about sightings. There was no answer. I left a message, but my call was never returned. When we realized we could not make it to Haig, then to Rawlinna and back in a day, we repeated our earlier plan. We drove up and down the Eyre Highway, stopping at every roadside reserve, or accessible stand of acacias, and having a good look. Unidentified perched birds brought us to a halt. They were usually Spiny-cheeked Honeyeaters, and once, a pair of Welcome Swallows. Once I saw a parrot. I jumped out of the car and scrambled over hills I would usually have thought too steep. But I found the parrot. It was an Australian Ringneck. Wedge-tailed Eagles and kestrels dominated our bird list. I'm not sure whether I am in a position to dispute that Naretha Bluebonnets are moderately common to common along the Eyre Highway, but I can say with confidence that there were none in the places I looked for three long days between Cocklebiddy and Border Village. Rog had had enough and we turned for home. We spent the night at Border Village. The mallees were flowering. I wandered around in the national park, enjoying the honeyeaters, and wishing just one of them was a parrot. The most common bird was the Spiny-cheeked Honeyeater. There were also two species which were present which were well outside their recognized range: Brown Honeyeater and Brush Bronzewing. I was very disappointed. It is human nature. Rather than celebrate my Princess Parrot, I mourned the lack of Naretha Bluebonnet. The ultimate irony was watching Eastern Bluebonnets as we had coffee at Lake Tyrrel on the way home. I did not enjoy them as much as I usually do. Roger jokes that each new tick costs $1,000. This trip cost roughly $8,000 for both of us, so that's $4,000 for me, and I got two ticks. Seems like the cost of a tick is now $2,000! I suppose it makes sense, that birds get harder and hence more expensive as your lifelist grows. I shouldn't complain about that. But still, we travelled around 5,500 km, and I worked hard. I felt entitled to my bluebonnet! I came home to learn that my piece about Noisy Miners had been broadcast on the ABC and that the Eaglehawk Neck pelagic had recorded Southern Fulmars. My plans for 2017 were starting to form. I set off full of hopeful anticipation. I was on a roll. Apart from dipping on the seemingly impossible White-necked Petrel, I'd done very well so far in 2016, starting with the cooperative Paradise Shelduck at Lake Wollumboola in January, then surpassing all expectations in the Torres Strait in March. So I expected to see the Copperback Quailthrush, a bird I had heard in 2011 at Yumbarra Conservation Park and whose nest and eggs I'd admired at Lake Gilles Conservation Park. 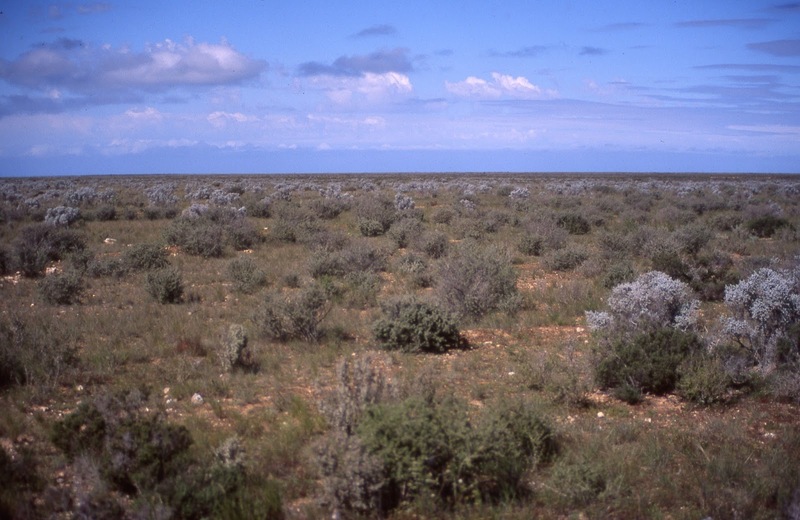 I had four possible sites to look for it: the above mentioned Conservation Parks in South Australia and two sites in Western Australia: scrub around the Mundrabilla Roadhouse and Karrawang Nature Reserve near Kalgoorlie. I knew Roger wouldn't want to drive as far as Kalgoorlie, but I wasn't concerned. I expected to get the bird at Lake Gilles. Heaven knows why I was so confident. My eyesight is not what it once was. 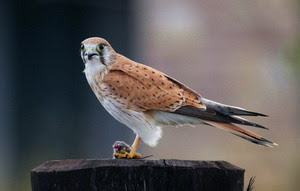 And I had missed out on seeing this bird on at least three occasions, when I'd been with other birders who had seen it. And yet I expected to see it. Our trip started off in Port Fairy, where I was booked on a pelagic with Neil Macumber on Sunday 8 May. My sister-in-law had never seen an albatross, and I wanted to rectify that situation. The weather was dicey and Neil could not confirm that the pelagic would proceed, but we set off from home nevertheless. On Saturday, Neil gave us the bad news: seas were too rough; the pelagic would not proceed. My disappointed sister-in-law and I enjoyed a rainy day walking around Port Fairy instead. Then she and my brother headed east, and Roger and I set off westwards, towards Copperback Quailthrush territory. There is little to report of interest about our trip from Port Fairy to Kimba, where we were basing ourselves for three days to explore the Lake Gilles Conservation Park. The best bird sighting was a pair of Brolgas that flew low over the car on the first day as we left Port Fairy. It was a breathtaking site. Then we recorded huge numbers of Black-shouldered Kites as we travelled from Bordertown to Clare. At Wilmington, we saw Rainbow Lorikeets, a familiar bird from home, but here well outside their recognized range. We observed two interesting insect phenomena (which actually occurred later in the trip, but this is as good a place to mention them as any). One was many thousands of flying termites which must have just erupted: this was in the middle of the day, south of Lake Gilles. The other was several swarms of unidentified insects flying out of the roadside trees, like thought bubbles in a cartoon. I don't remember seeing such a thing ever before. We drove directly to Lake Gilles and I spent some time looking for quailthrush. There were Emus, Crested Bellbirds, White-browed Babblers and lots of honeyeaters: White-fronted, Yellow-plumed and Brown-headed (the latter were more colourful than I'm used to). There were several sorts of thornbills and friendly, noisy Weebills. But there were no quailthrush. I wasn't daunted. We had three days. And I'd been told to be there at dawn. So one afternoon's absence of quailthrush did not upset me in the least. The next morning, I was up in the dark. It was cold, 3 degrees according to the car thermometer. But worse than that, it was foggy. I drove at 60 k for the 17 kilometres from Kimba to Lake Gilles. I felt very brave, very cold and, I confess, a little scared. The road trains on the Eyre Highway do not slow down because of a little fog. I thought of Rog snuggled into his warm bed as I drove slowly, expecting kangaroos to jump in front of the car at any second. Perhaps I have an overdeveloped sense of entitlement, but I do believe that a girl who gets up in the dark and drives by herself 17 kilometres in the fog, is entitled to see a Copperback Quailthrush. I did not. The dawn chorus was subdued, perhaps because of the fog. I identified Grey Butcherbirds, Spiny-cheeked Honeyeaters, Red Wattlebirds and corvids. Later, magpies and Galahs joined in. I did not hear any quailthrush. The first birds I saw were Yellow-rumped Thornbills, then White-winged Choughs. As soon as I could see, I drove up and down the road, with the windows down. To my mind, enduring the cold was, in itself, justification for seeing a quailthrush, let alone driving from Melbourne to Kimba, then to Lake Gilles in the pitch dark. By 8 o'clock the fog had lifted and there was a beautiful blue sky. I had fun birding until 9, when I returned to Kimba for some breakfast. Of course I was disappointed. But I put the lack of quailthrush down to the fog. I'd have better luck tomorrow. I knew that. After breakfast, Rog and I both returned to Lake Gilles and I explored the scrub some more. After lunch, we visited Secret Rocks, which had very healthy populations of both Singing and Spiny-cheeked Honeyeaters and one very confiding Black-eared Honeyeater, who really wanted his photo taken, if only I'd had the appropriate photographic gear. I also saw some spectacular fairywrens that day. The next morning, I ate some cereal as I dressed. There was no fog, so the trip was much quicker. However, this morning there were kangaroos, which kept me on my toes. The temperature was 3 degrees again. This morning, there was no dawn chorus at all! Yesterday, I'd put the unimpressive dawn chorus down to the fog, but today, I was forced to explain the total absence of dawn chorus by the time of the year. I walked up and down and I drove up and down, but there was no hint of quailthrush. I returned to Kimba very disappointed, and seeing one very large black feral cat heading into the bush did not improve my mood. Rog and I returned to Lake Gilles and I walked every track I could find while he sat in the car reading his newspaper. I saw several White-eared Honeyeaters, a bird I had not seen yesterday, and conversely, dipped on Brown-headed Honeyeaters, which had been so numerous yesterday. At the end of the day I was exhausted from so much walking, but I still did not have my quailthrush. Now this was getting serious. We were due to move on tomorrow. I really did not want to leave Kimba without the quailthrush on my lifelist. At dinner, we complained to the publican that the local quailthrush were not performing on demand. She suggested we contact a local friend of hers who had lots of birds on his property. So we did. And to cut a long story short, the next morning we visited his place and I ticked the quailthrush. Howzat! In an exceptionally good mood, we set off westwards towards the Nullarbor and our other target species: the Naretha Blue Bonnet. But that's another story.